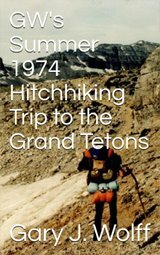 This page shows archived posts for Gary J. Wolff's blog from April-June, 2016. "As we celebrate Father's Day, we should ponder the sad plight of the 20 million American children who are growing up without their fathers in the home. Among other unfortunate effects, the trends toward non-marriage.....are a direct attack on fathers. The bond between a child and his mother is an obvious fact of nature, but marriage is the relationship that establishes the link between a child and his father. There are many causes for the dramatic reduction in marriage, starting with unilateral (no-fault) divorce, which spread across the United States in the 1960s and '70s, putting government on the side of marriage breakup. Since the federal government created the child-support bureaucracy, the majority of divorces have been initiated by women. They confidently expect that pro-feminist family courts will award them a steady income for which they will never be held accountable. The more child support that divorced fathers are ordered to pay, the more federal funds flow through the hands of the states, which compete for federal bonuses given to states that collect the most child support. It is profitable to state bureaucrats to make sure that fathers are permitted to see their own children only a few days per month, so support payments can be set at the highest possible level. Women have discovered they can use a request for an Order of Protection against their husband as "the gamesmanship of divorce" (in the words of the Illinois Bar Journal) in order to get sole child custody plus generous so-called "child support." It's easy to get such orders without any evidence of abuse or even a threat, without notice to the husband and with no danger of prosecution for perjury. Federal and state laws and subsidies that undermine marriage are the biggest fiscal as well as cultural issue of our times." 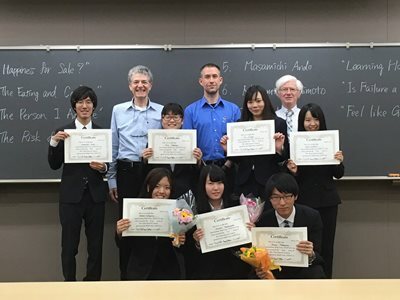 This university's ESS (English speaking society) holds a speech contest every June, a recitation contest just for college freshmen, where they recite from memory a famous speech from history, like JFK's inaugural address, Martin Luther King Jr.'s "I have a dream" speech, Steve Jobs' 2005 Stanford Commencement address, etc. These kids were AMAZING!! And it was my honor to be able to help judge the contest again this year. 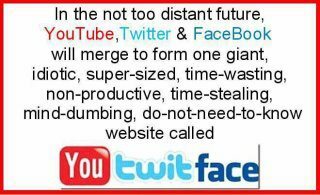 June 10, 2016 - Are you a Twit Face? 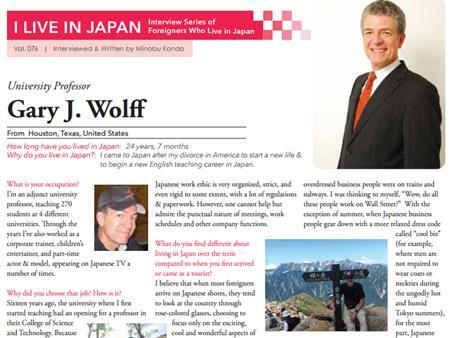 Yours truly will appear in next month's (July) issue of Japan Up! magazine, a free English publication widely distributed in Japanese restaurants, supermarkets, and other stores in the Los Angeles, California area introducing authentic Japanese cuisine, trends, and culture. Hoo wah!! 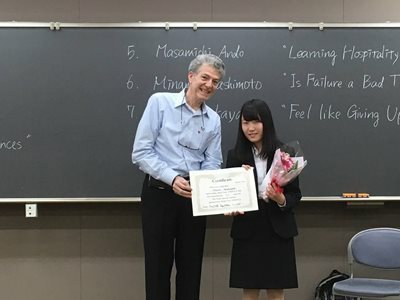 I never cease to be amazed at the ambition of some Japanese university students who are so passionate in improving their English and public speaking skills. 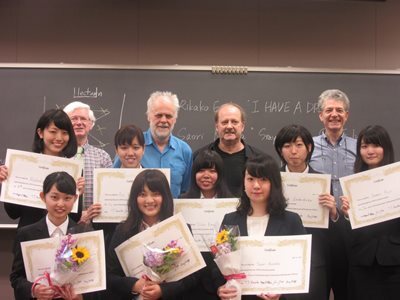 For the 7th consecutive year, on Sunday, May 22, 2016 I had the pleasure of helping judge a university student English speech contest sponsored by my university's ESS (English Speaking Society). 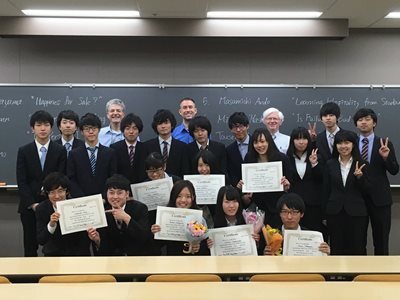 These 2nd-year students were truly amazing, sacrificing an entire day to give by memory in front of 100 people a 7-min. speech which they composed themselves. 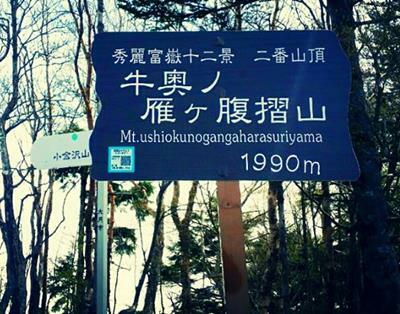 Is this possibly the longest mountain name in all of Japan? This pic was posted recently in the "Hiking in Japan" Facebook group, and having scaled 38 of Japan's 50 tallest peaks, it really jolted my attention. Loosely translated, I believe it means "Rubbing the belly of a wild goose inside a cow" Mountain. Wow, how funny! For anyone interested in hiking to the top of this 1990m peak in Yamanashi Prefecture which offers an excellent panoramic view of Mt. Fuji, here's some information in Japanese including route map and here's the Google Map. p.s. This reminds me of a story written by a Japanese university student a few years ago about the longest train station name in the world, the "Llanfairpwllgwyngyllgogerychwyrndrobwllllantysiliogogogoch" train station in Wales. Wow! A cool cat has brought fame to Tokyo's otherwise ordinary Seibu Ikebukuro Line, bringing plenty of smiles to commuters & animal lovers, many of whom get on just to have a chance of meeting this very special feline passenger. Apparently, the cat travels on his own and decides where to get on & off. And it is said that the cat has even learned proper train etiquette, keeping himself neatly in a compact manner to save room for other passengers to sit, yet taking the liberty to spread out for a nice cat nap when the train isn't so packed. 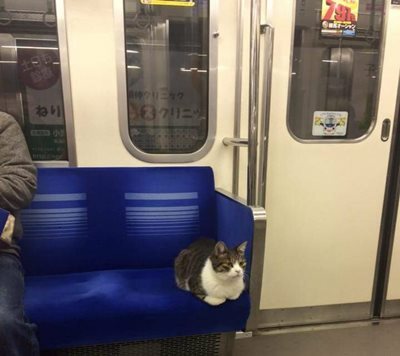 Generally, in Japan animal carriers are required for pets on trains, however, for the time being, the Seibu Ikebukuro Line seems to be turning a blind eye to this popular feline commuter. 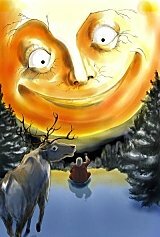 May 4, 2016 - Have you noticed that bright orange "star" in the lower southeast sky? The red planet Mars is often difficult to see, as it’s not a very large planet. But every 2 years, around the time we pass between Mars and the sun, the planet brightens dramatically and becomes a splendid sight in our night sky. That’s happening right now. In fact, we’re now less than a month away from the planet’s May 22 opposition, when Earth will pass between Mars and the sun. When Mars then reaches its crest of brightness, it will have quadrupled in brilliance since the beginning of April. Mars is easy to spot in the lower southeast sky, and although it's not so bright, you can also see Saturn a little down to the left of Mars, as well as Antares, one of the sky’s brightest stars in the constellation Scorpius, almost directly below Mars. 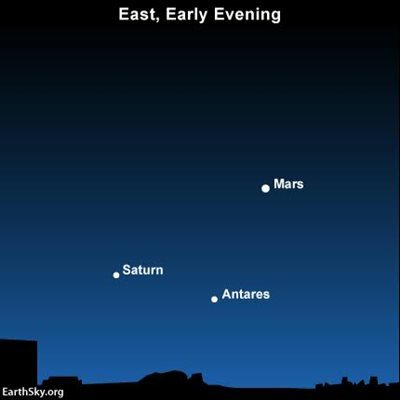 In early May, Mars rises at about 9 p.m. local time at mid-northern latitudes. 2016 is a grand year for seeing Mars. The best months for Mars viewing in 2016 are May and June. But the planet remains bright throughout the summer of 2016. Don't miss it! While out on my mountain bike during Golden Week a few years ago, the highlight of that day was to run across an elderly lady's home adorned by an uncountable number of handmade windmills (kazaguruma, 風車). As you can see in the video below, most of these windmills are made from aluminum drink cans and PET bottles. According to the nice lady, making these amazing windmills is her son's hobby. May 2, 2016 - Can you tell that it's azalea season in Tokyo? Just LOVE this color! 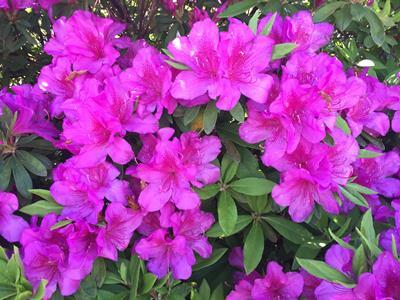 The 2016 Bunkyo Azalea Festival at Nezu Shrine, one of the best places to view azaleas in Tokyo, runs thru Thurs. 5/5. 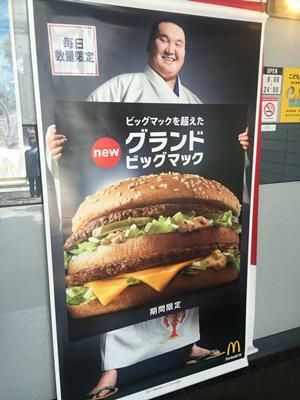 Mongolian yokozuna grand champion sumo wrestler Hakuho, the most successful sumo wrestler in Japanese sumo history, is the new poster boy for Mickey D's Grand Big Mac. And having twice tried it myself, although the taste I believe is exactly the same as a Big Mac, I can assure you that this burger is truly GRAND!! Forget the fries or other side orders, as it's a meal all by itself. 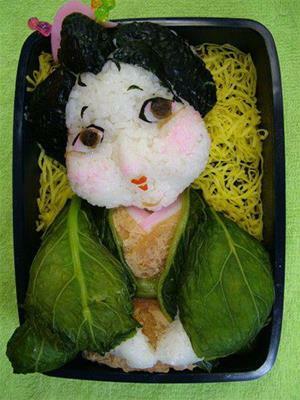 Japanese people are SO creative! But wait....isn't she a little too gorgeous to eat?!! It's that time of year in Japan again....GOLDEN WEEK!! To celebrate Children's Day (こどもの日, Kodomo no hi), May 5, one of the 4 national holidays during this week-long holiday period, "koinobori (鯉幟)," or carp streamers, are flown around the country in honor of Japanese children in the hope that they will grow up healthy, strong, & happy. These koinobori were flying along the banks of the Edo River (江戸川) on an absolutely gorgeous day in Tokyo. April 17, 2016 - Attention university students! 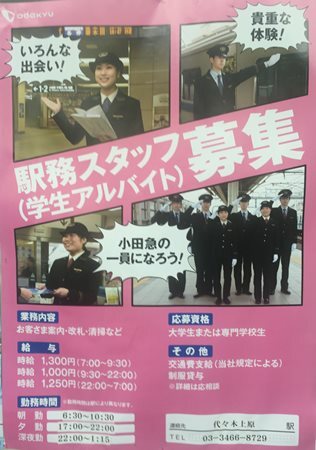 The Odakyu Railway Co. is hiring. And your dream job is waiting for you as a train station attendant. Make up to ¥1,300(~$12)/hour if you're willing to brave the morning crush hour from 7:00-9:30 am. 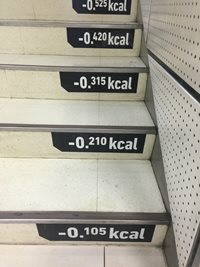 Ever wondered exactly how many calories you burn up when walking up the stairs? Well, the Japanese have you covered. In fact, they have it down to an exact science in the famous Tokyu Hands household goods store in Shibuya, Tokyo. 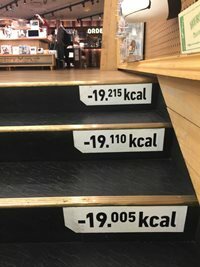 From the B2 (2nd basement) floor all the way up to the top 6th floor, they've put the cumulative calories consumed on each stairstep! WOW! Only in Japan! Yep, it's that time of year again! Even after a quarter-century in Japan, it never gets old. I wish we'd had a little more sunshine today, but some of my pics turned out pretty well anyways. 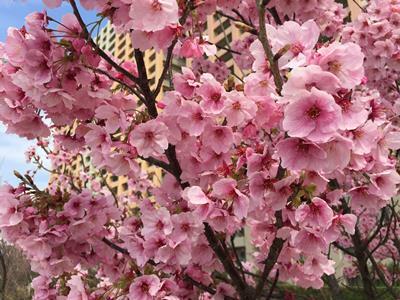 Please check out my 36-pic Flickr cherry blossom album if you get a chance. Chidorigafuchi Park, without question one of the most popular spots to view cherry blossoms in Tokyo (especially for the nighttime lightup), was stunning (and very CROWDED) as always.